Where was the first concrete highway built in the U.S? The first concrete highway in the United States was built near Pine Bluff, Arkansas, in 1913. This was five years after the introduction of the Model T Ford. It was 24-miles long. Today, the national highway system extends over 160,000 miles. Much of it is in need of maintenance and repair. Fortunately, our understanding and application of concrete has advanced considerably since then. As a result, innovations such as those found in EdenCrete® can significantly enhance compressive, tensile and flexural strength for much longer lasting highways. 1. Top left- Old bridge being used in Arkansas prior to the Dollarway Hwy. 2. 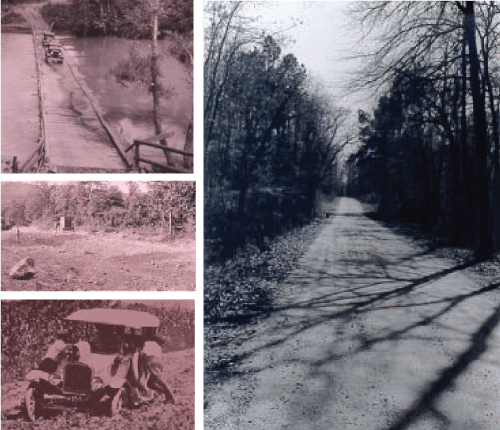 Middle left- The harsh roads of Arkansas in the 1900s. 3. Bottom left- A familiar scene to Arkansas before the construction of the concrete highway. 4. Right- The Dollarway Hwy completed.